Iterasi is a browser-based bookmarking tool that can be used to capture a webpage in the state in which you see it and save it for later. Unlike some other bookmarking tools, Iterasi doesn’t just bookmark a link to the web page you saved, but saves a screenshot of the site in html format. Plenty of web pages are using technologues like CSS and AJAX, and this kind of dynamic content changes over time, so just saving a link to the site is often not enough. This tool is useful for sites containing submission forms, receipts for online transactions, or sites using Google Maps mashups. In addition, some web pages will simply disappear over time. The browser tool is easy enough to install, and creates a link on your toolbar as with del.icio.us. When you are on a page you want to bookmark, you simply selected ‘notarize’. This is all simple enough, but the tool is let down by the time it takes to bookmark the page. If I want to do this on del.icio.us, the process takes a few seconds, but Iterasi takes more than 25 seconds to save the page. The site is still in beta, so perhaps this is just teething problems, but it could do with speeding up the process to make it more usable, as all other tabs are inaccessible while you wait. Once you have saved and tagged the page, you can view your saved pages via the site. There is also a useful search tool to find the page you want if you have saved a lot of screenshots. This will search according to the tags you have attached, as well as the text within the saved pages. The search tool, and the way you can organise your saved bookmarks is a big plus for the service, as is the scheduler, which allows you to take snapshots of a web page at regular intervals. Click on a page and you can view it in the state you saved it or choose to go to the current version instead. You can scroll up and down the page in its saved state, so this is useful for saving news articles. 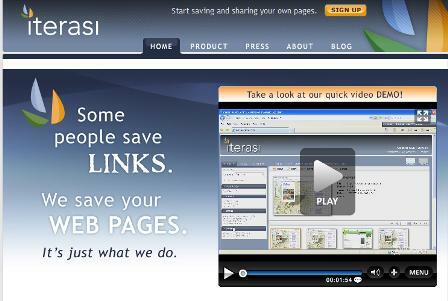 The web pages are saved on Iterasi’s servers, something which is free at the moment, though the company plans to charge for this in future. The browser plugin is now available for both Firefox and Internet Explorer, and quick enough to install, though the installation process closed all my browser windows without asking me. Slow save times aside, Iterasi is a useful bookmarking site, and the ability to save snapshots of web pages differentitates it from other tools like del.icio.us.